“SMSF regulation is appropriate” Productivity Commission SHOCK you won’t believe!! Yes folks, the PC’s Final Report on Super tells us that the regulation of self managed super funds (SMSFs) is “appropriate” and plumps for more attention to ‘advice’ in setting up SMSFs. Verily, my gob was truly smacked and smacked again. In any event, there’s not much more to say other than to hoist an old column from the archives – below. Here’s this Wednesday’s Age and SMH column. In the last fortnight, the Government has ticked one of its boxes for next year’s election, launching policies to tackle over-regulation. And Treasury Secretary Martin Parkinson was reported as intimating that more regulation was needed to address risks posed by Australia’s DIY super. The contrast between minimising regulation ‘in general’ while expanding it in particular illustrates Lord Acton’s dictum about rowing as a preparation for public life – enabling one to face in one direction while travelling in the other. Both Conservative and Labour administrations approach deregulation with apparent enthusiasm, learn little or nothing from previous efforts and have little if anything to show from each initiative. Our model of regulation review was a noble try at its birth late last century as Western governments rationalised the detritus of decades of ad hoc political favouritism and regulatory capture. But it failed even then. Bureaucracy and politics rewards ‘can do’ types, so regulatory impact analysis became a box ticking exercise, obeyed in the letter, but not in spirit. Today with much of the purely deregulatory work done – with governments vacating the regulation of airline schedules and shopping hours – the quality and responsiveness of regulation matters more than its quantity. But regulating well involves finessing the micro-detail – as does running a business or building software – and economists’ cost/benefit or regulatory impact analysis doesn’t and can’t stoop to the micro-detail. Neither does business or political advocacy against over-regulation. Take the Treasury Secretary’s concerns on DIY super. He’s right: allowing unsophisticated investors largely free rein in managing their investment portfolio is a time bomb. Ask 34-year-old paraplegic, Alison Cook, whose story was reported this weekend. Her DIY super fund lost two thirds of her accident compensation payout – nearly half a million dollars – through ridiculously risky investments that earned her advisor juicy commissions. Yet DIY super isn’t too lightly regulated. It’s too heavily regulated. It’s only a time bomb because it’s exquisitely badly regulated. Most self-managed super funds (SMSFs) comprise a diversified pool of ‘vanilla’ assets – shares, bonds and cash – managed by families for their retirement. So, unsurprisingly, most are sensibly self-managed. But incredibly, the regulation governing DIY funds is a cut down version of that governing multi-billion dollar funds. To establish a DIY fund one first needs a Trust Deed – usually purchased from a city law firm (mine runs to 64 pages and sits, unread, on file). And while Mum and/or Dad go trustee and manage their own portfolio, their accountant manages ‘compliance’, drafting resolutions that trustees bemusedly sign. Then another professional firm audits the fund to comply with the Superannuation Industry (Supervision) Act 1993 and regulations. For simple ‘vanilla’ funds all this could be handled at a fraction of the cost, as our taxes are, via self-assessment subject to risk targeted random auditing by the ATO. At the very least shouldn’t we accept Recommendation 30 of a 2007 Joint Parliamentary Committee, that where funds consistently comply, they revert to five yearly rather than annual auditing? One report signatory, Penny Wong, now finds herself the Minister for Finance and (ahem) . . . Deregulation. But all the gold plating – which on my rough figuring lowers returns by around $200,000 over the forty-year life of an SMSF – isn’t the worst of it. Even as SMSFs consume billions in professional services per year, horror stories are increasingly common. 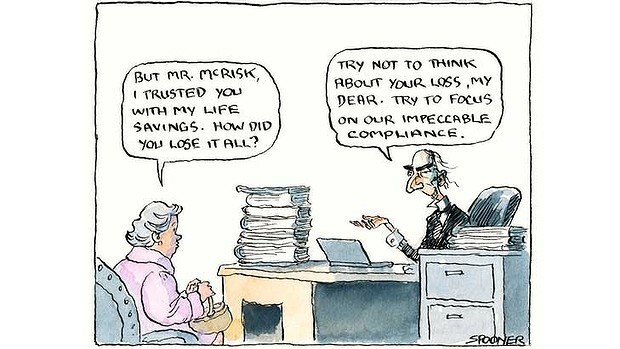 Meanwhile, the auditors tick boxes – just like the regulators. Each year my fund is audited to comply with Sections 52(2)e, 52(2)d, 62, 65, 66, 67, 69-71E, 73-75, 80-85, 103, 106, 109, 111, 112, 113(1A), 121 of the Act and Clauses 4.09, 5.08, 6.17, 7.04, 13.12, 13.13 and 13.14 of its Regulations. Auditors check that funds have an investment strategy considering risk, return, liquidity and diversity and that the investments are in line with the strategy (That’s clause 4.09 since you ask). As expensive as they are, those requirements could have rescued Alison Cook from the predation of her professional advisors. But here’s the thing; those who need the protection lack the skills to select the right advisors, lawyers, accountants and auditors. So here’s the bottom line: Our DIY super regulation is hugely and wastefully over-regulated for people like me who fancy they don’t need all the professional ‘help’. But with a carnival of high-risk investment products and predatory investment spruikers out there, all those ticked boxes are an elaborate and cruel hoax for the unwary. Oh, and the Government’s new regulatory policy will do nothing to address any of this. 3 Responses to “SMSF regulation is appropriate” Productivity Commission SHOCK you won’t believe!! yeah, the PC seems to have rather a lack of good economists nowadays. Why is that? It’s never had many good ones. The early IAC was a hotbed of real academic excellence – not always a great thing as they didn’t understand some industries very well (eg the car industry). Bob Gregory was there as were quite a few other people. But by the time I got there there weren’t many economists at all. And those that were there were working away on tasks which had been part of the glory days but are of little significance in influencing policy today – like estimating effective levels of protection. I recently became friendly with a youngish economist who’d spent a bit of time there in the last ten or so years and he was shocked that there was so little regard for careful economic thinking and left. Ralph Lattimore was picked up from the BIE in 1997 (I think) and he was always very good. But I can’t think of anyone else – which I expect is unfair to quite a few people. Richard Snape and Sue Richardson were involved in the Commission and did some good things there. In any event, at least in my memory and ongoing experience, so many others are career econocrats. There’s an economics degree tucked away in the CV, but they do econocrat economics. And in econocrat economics, if you don’t know the answers before you start, you certainly know what answers are wrong before you start. Not that there’s anything wrong with that. As you know, it’s not as if I think academic economics is rich with robust policy answers to the problems we face. It’s just that the PC’s schtick is that it’s a really rigorous policy think. It isn’t even equipped to be that, and if it was its management wouldn’t allow it to be that. That’s because management puts its direct usefulness to the central agencies ahead of encouraging open minded exploration within its walls. That’s a perfectly reasonable call. It’s just that it leaves this strong tension between its image of itself as fearlessly rigorous and independent – the image that lots of ‘opinion leaders’ buy into – and the more pragmatic reality. That tension ensures that it’s really a temple to the very best of Australian intellectual mediocrity. As a trustee of an SMSF for my wife and myself, now in pension phase, the mind boggles at the amount of bureaucratic red tape that has to be negotiated each year. The cost of compliance, including actuarial reports and audited accounts eats up quite an amount of the pension that we could otherwise have. The ALP proposed removal of franking credit refunds, where we will get a zero tax refund, but all the costs of producing it, will be too much to bear. I would call that elder abuse, for which we are having a Royal Commission. Although we have a life expectancy of 10- 20 years more, we will be cashing in our super, re-buy our investments, and become normal PAYE tax payers, using the otherwise unused credits to pay any tax owing.